Inside: One of the nicest things about Christmas is thinking about the people who make the world a warmer place all year… people like you! More Info: A gold foil frame surrounds an illustration of six softly glowing candles. More Info: Two rows of Christmas trees separated by a row of gifts are featured on the front of this Christmas card that also features gold foil stars and ribbons. A full-color image appears on the inside of the card. More Info: A quiet snow covered street with silver foil highlights and a silver foil frame around an evergreen tree appear on the front of this Christmas card. More Info: Gold foil and glitter add sparkle to this wonderful artwork that features a fruit basket and two small birds. Also features an insert with full-color artwork. More Info: This basket of ornaments image is printed on an acetate sheet that sits on top of the card stock, giving a unique look to this Christmas card. Full color ornaments border the interior pages of the card. Inside: You're like a mother all year through… So Christmas is a good time to Send this special wish to you… Merry Christmas with Lots and Lots of Love! More Info: Textured card stock and die cut edges are used to create this super cute card of a bear waiting for Santa. Inside: Lots of fun and happiness is being wished for you, to hope that every dream you have at Christmas will come true! Merry Christmas! More Info: Dots of silver foil appear in the Christmas trees of this cute polar bear card. Inside: For all the gifts you give all year through… the gifts of kindness and patience, strength and understanding. Thank you, Dad, and Merry Christmas! More Info: A polar bear with a red scarf and candy cane are on the front of this card for Dad. More Info: Textured card stock adds a unique look and feel to this teddy bear design. More Info: Pastel shades of pink, blue, and purple highlight this cute bear with snowflake patterned boots, gloves, hat, and scarf. Also features silver foil. More Info: An abundant use of glitter adds a magical touch to this simple winter illustration, giving the illusion that snowflakes are softly floating to the ground. More Info: This cute and funny Christmas card will bring a smile to everyone. Features silver foil snowflakes. Inside: At Christmas, you help everyone to have fun… That's what makes you such a special Great-Grandson! Merry Christmas! More Info: Die cut edges are featured on this Christmas card of a boy throwing a snowball. Front: Happy Holidays - Every moment of the year has its own beauty. Inside: May the beauty of the season and the peace of nature bring you a world of joy to remember all year. 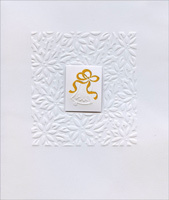 More Info: An abundant use of bronze foil in the swirls and snowflakes allows this illustration to jump off the card. Front: Have you been naughty or nice? Inside: Merry Christmas! Woof! Woof! More Info: Santa doesn't look quite like himself in this cute and funny bulldog Christmas card that features gold foil lettering. Inside: Christmas is a lot of fun… a happy time for everyone so hope that Santa brings for you all the things you'd like him to! More Info: Cute bunnies sing their Christmas carols on this die cut card. Inside: Hope Christmas brings you all the things you really like the best! Have Lots of Fun! More Info: A cute bunny rabbit gets tangled in the Christmas lights on this playful Christmas design. Front: It's Christmas Time, Son! Inside: What makes Christmas happy and a whole lot of fun? Why sharing all its good times with a very special son! That's YOU! Merry Christmas! More Info: The use of silver foil for the lettering, flame, and accents around the candle glow add a touch of sophistication to this simple illustration. Inside: Merry Christmas, Great-Granddaughter. It's you who makes the season bright for me! More Info: Your great-granddaughter will love this cute Santa cat card. More Info: Silver foil lettering and a full-color interior enhance this Christmas card featuring an illustration of a Church in a small town. More Info: Blue, yellow, green, pink, and purple embossed ornaments float on a dark pink background on this Christmas card for Granddaughter. More Info: Overlapping geometric shapes, a present, ornaments, and Christmas tree are the focus of this contemporary design that features gold foil trim around the images. Inside: Snowflakes falling behind a star-topped tree; a candle brightly glowing for all those to see. A crackling fire beneath a stocking unfilled; warming a child, just waiting to be thrilled. Wishing you all the delights of Christmas. More Info: This simple Christmas tree and hearth illustration has gold foil accents. More Info: This contemporary Christmas tree features alternating shades of green with a faint image of a vine running from bottom to top. 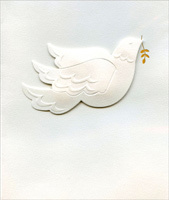 Gold foil stars add a touch of class to this simple but wonderful illustration. Inside: Have a real cool yule! More Info: Cool yule is the message on this great card featuring Santa and a reindeer in their stylish sunglasses. More Info: An array of vibrant colors are featured in this image of a Christmas tree and presents. Embossed ornaments, candy canes, and stars along with glitter highlights enhance the card. More Info: Two dear pause at a stream under a watercolor sky. Glitter makes the evergreen trees sparkle. More Info: The soft earth tone colors and serene wildlife scene provide a perfect backdrop to the green foil lettering that seems to float above the artwork. Inside: As the snow blankets the earth and a hush falls all around, never do we hear a more peaceful, beautiful sound. More Info: The simple illustration of forest has just a few touches of glitter as if the moonlight is bouncing off the snow covered branches. Front: For a Wonderful Nephew - Christmas means more when its joys can be shared. More Info: Embossing (raised up images) creates a wonderful 3D look and feel on the front of this Christmas card for Nephew. The embossed dove, flowers and vines create the look and feel of a sculpture. More Info: Embossed (raised up images) pine cones and floral swirls bring a wonderful texture to the front of this Christmas card. Features gold foil lettering.